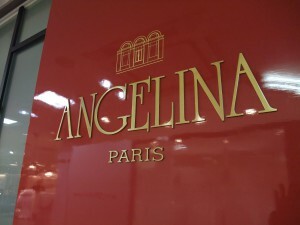 Salons de the ANGELINA is a classic and lovely cafe in Paris. They have the branches in Japan. 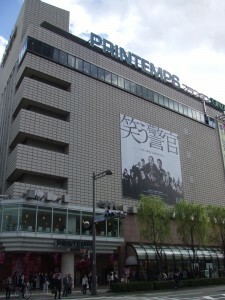 PRINTEMPS GINZA is the largest one. “Mont Blanc” has become a synonym for the ANGELINA. From tomorrow, we have a big bargain at Gotanda TOC. 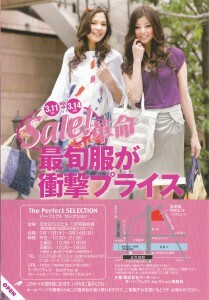 Various fashion brands have a sale from March 11th to 14th. As a bargain hunter, I can’t miss this awesome chance to buy clothes and shoes for spring. TOC is the name of the building. They often have special events, including this kind of big bargain. This fashion bargain sale is hold 2 or 3 times in a year. Basically, we need the invitation card to enter and join the bargain. But don’t worry. You can of course join there if you write down your name and address at the entrance. That would be the next invitation. March is the season for graduation. Especially at the beginning or middle of March, Japanese universities and colleges have graduation ceremony. At the ceremony, many female students wear “Hakama” as formal wear. “Hakama” is a pleated skirt worn over Kimono. This is a traditional formal wear in Japan. Now various colors and designs attract a lot of girls in this season. When you walk around cities, you may find some girls wearing Hakama and let’s say “congratulations!” to them. 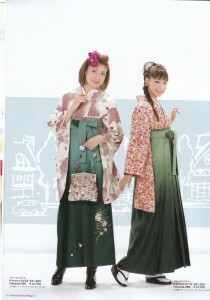 The combination of Hakama and Kimono is really beautiful and gorgeous. I’ve always been a fan of Samantha’s handbags! 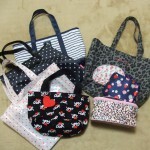 Samantha Thavasa is a Japanese fashion company, known for their popular handbags and jewelry. Not only Japanese popular models but also famous celebrities, like Nicky Hilton, Victoria Beckham, and Tinsley Mortimer designed the handbags. Jewelry; Samantha Tiara, Samantha Silva etc. This is a clipping from one of my favorite fashion magazines. As I mentioned before, one of the popular brands for housedress is “gelato pique”. Their colorful and sweet design makes me warm and happy in my room. 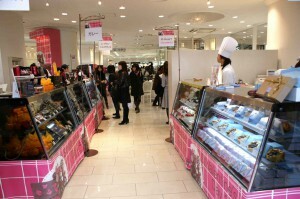 The concept of gelato pique is “sweets of fashion” for working women. After hard work, they can relax in soft housedress at home. This is my first writing of this year. I wish all of you have wonderful days. In Japan, a lot of tailors and department stores have an interesting custom of selling “lucky bags” during the New Year’s holidays. We wanna stay warm in a room during cold winter. Wearing a cute housedress is becoming popular among fashion models and young girls. Especially, soft touch housedress is fabulous! Let me show you some of my collections. These are something extra to fashion magazines. 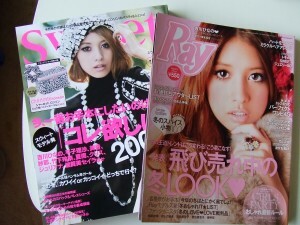 These days, fashion magazines are sold with something attractive like small bag, pouch, scrunchy(シュシュ) and more. 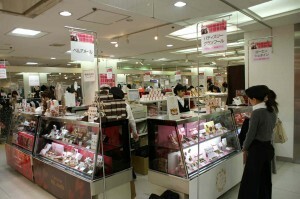 Printemps Ginza has a big sale at Tokyo International Forum from December 3rd to 6th. 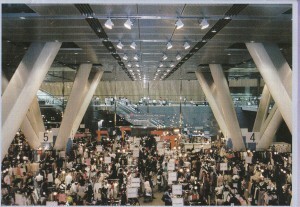 Tokyo International Forum is only 1 minute from JR Yurakucho station. This sale is held for the first time in 2 years so it is going to be really fun! Au Printemps is a French department store in Paris. 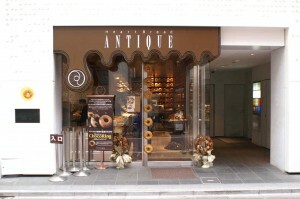 It has a branch in Ginza shopping district. Printemps Ginza is a big department store and the target is female office workers from 20’s to 40’s. While Harajyuku and Shibuya can be regarded as mecca of young fashion, Ginza district has calm and gorgeous atmosphere for women following the latest fashion. In my free time, I enjoy shopping, watching movies and travelling. 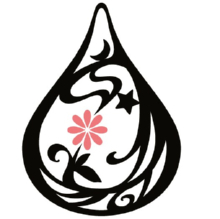 In this blog, I’ll introduce “Japanese Pop fashion”. It’s fun to see girls wearing unique clothes in Tokyo. We can get the information from magazines, TV, and on the Net. Now, around 100 or more fashion magazines are published in a month. The models have a lot of influence on Japanese girls and women. We like to have the same clothes with them or arrange the items in our own way. Anyway, such magazines could be one of the sources to get the new information on fashion. Personally, I get the information from some of them, so let’s share them in this blog! From next time, I’ll write about some pieces of them.